They played from behind and won. They built a big lead and won again. The Wolverines knocked off the top seeds and kept marching toward a goal. No matter what the challenge, the Wood River High School girls' varsity basketball team kept its eye on the prize of a return state tournament berth during two huge Great Basin Conference tournament road triumphs last week. Streaking Wood River (12-9), a winner for the seventh time in eight games, beat the top-seeded Twin Falls Bruins 54-42 Thursday then came right back and captured its first win ever on the Minico hardwoods by a 54-40 decision Friday in Rupert. The back-to-back victories put Wolverines of coaches Kevin Stilling, Mendy Benson, Fred Trenkle and J.C. Nemecek into Tuesday night's GBC championship game against the upstart Burley Bobcats (14-11). It meant the No. 4 and No. 5 seeds battled for the GBC prize. If Wood River beat Burley Tuesday for the third time in four meetings, the Wolverines earned an automatic berth in the State 4A tournament starting Thursday, Feb. 16 at Timberline High School in Boise. A Burley win Tuesday would have sent the double elimination tourney into a deciding game Thursday, Feb. 9 at 7 p.m. in Burley. Stilling was hoping that wouldn't happen. He and his staff were concerned with paying attention to details and making the adjustments to win, whatever the foe. The core of the current Wolverine team captured second place in the State 4A girls' basketball tournament last February and has amassed a 50-19 record the past three seasons. At Twin Falls, Wood River stormed back from a 19-11 deficit with a 10-0 run and earned a 23-22 halftime lead—a lead the Hailey girls never relinquished—on Cheyenne Swanson's putback near the end. Kaitana Martinez (1,019 points, 86 career games) led Hailey with 15 points, Haylee Thompson added 13, Swanson 8, Hannah Belloli 8, Haillie Taylor 6, Emmalie Dion 2 and Cookie Benson 2. Wood River out-scored Twin 16-6 in the third. "We clamped down big time defensively," said Stilling. At Minico, Taylor knocked down a big 3-pointer early and Belloli canned wide-open shots helping the Wolverines to a 26-12 lead at half. Thompson ended with 17 points, 9 rebounds, 5 blocks and 2 assists. Martinez added 13 points and 8 assists. Others were Belloli 8 points, Taylor 7, Rory Cole 4, Swanson 3 and Benson 2. With her big scoring night, 6-1 post Thompson (706 career points in 3 seasons) moved past Laurel Williams (699) into fourth place on the all-time scoring list behind Natalie Green (1,115), Martinez (1,019) and Lauren Morgenthaler (790). Wood River won for the first time on the Rupert floor after 14 consecutive losses dating back to 2004. And in five of those years, from 2006-10, a loss at Minico ended Wood River's season by knocking them out of the Great Basin tourney. Cinderella team Burley (3-19 last season) earned a return trip to the Wolverine gym Monday night with an upset 64-60 overtime victory over No. 2-seeded Minico (14-8) on the Spartans home court. The Wood River boys' varsity basketball team (2-15) hosts the Burley Bobcats (10-8, 5-4) today, Wednesday on the Hailey floor then has its "Senior Night" Friday, Feb. 10 for non-league games against Rigby. 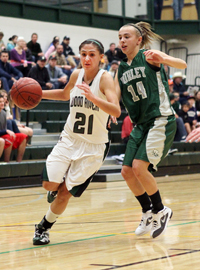 Wood River enjoyed another solid offensive effort in a 66-48 league loss at Minico (4-14, 2-7) Saturday. Austin Hafer (18 points), Braxton Parish (9), Ben Williams (9) and Jake Vegwert (6) paced the Wolverines. Coach Rick Bradshaw's Wolverines will open the Great Basin Conference tournament Tuesday, Feb. 14 visiting the winner of today's first-place game between host Twin Falls (17-1, 9-0) and Jerome (16-2, 8-1).